I love each of the individual ingredients in this sandwich, but together they’re even better. This is healthy, vegetarian and has a good amount of protein. If you want even more protein, you could add turkey! I like to make this open-faced for less carbs, but you can of course make it with 2 slices of bread if you prefer. Maybe you already know this, but if not, bread is actually one of those items in the grocery store that can have A LOT of sneaky additives and chemicals. I use Great Harvest bread (a Minnesota whole grain bread company) because their bread has 5 simple ingredients and no artificial additives or preservatives. If you know where to get bread like this near you, please do! I always encourage people to make yourself aware of the ingredients in your food and support local companies who produce food made with natural ingredients. The chickpea spread in this recipe is basically a hummus so you could buy hummus instead for more convenience, but I always like to make any spreads/sauces myself if it’s not too complicated. That way you know exactly what’s in it and you can control the flavors. I like to just pulse the chickpeas a for a few seconds so that they stay a little chunky. Enjoy your healthy lunch! Put about half of the can of chickpeas / garbanzo beans in a food processor or blender along with the garlic, lemon juice, olive oil and salt. (If you want to have leftovers for sandwiches later, you can use the whole can). Blend just a few seconds. I like when it’s chunky, but you can blend it longer if you prefer it to be smoother. On a slice of toasted bread, smear some of the chickpea mixture. 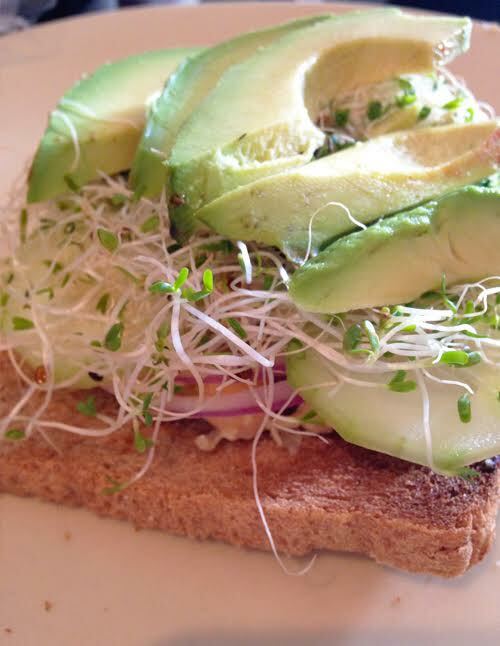 Add 4 slices cucumber, some of the red onion, sprouts and lastly avocado slices on top. Add a squirt of fresh lemon juice and voila!